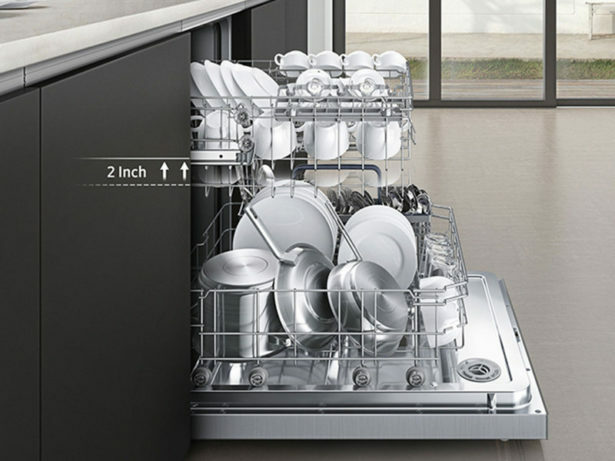 How to clean the dishwasher: from limescale to unpleasant odors, from all the little gaskets to accumulated dirt. Here’s how to clean and disinfect the dishwasher with natural products. A practical guide that will explain how to wash your dishwasher with natural detergents, such as vinegar and baking soda. Our health and that of the environment don’t go hand in hand with the use of detergents in mass. It’s very common to find limescale removers and disinfects for the dishwasher, however these products are rich in relatively hazardous chemicals and they can be rather expensive. An excellent alternative to the use of chemical detergents involves the use of vinegar and baking soda, two inexpensive, safe and effective solutions. If you’re dealing with limescale issues in your dishwasher, get a cloth soaked in distilled white vinegar, place it on the area of interest and let it sit for a few minutes, then rinse and dry. In order to clean the entire dishwasher, it will suffice to pour a liter of distilled white vinegar inside and let it run empty for a full cycle. This should be done periodically, especially after long periods of not using the machine. Vinegar, just like baking soda, other than cleaning and disinfecting, it can prevent and get rid of unpleasant odors. Vinegar is perfect to neutralise strong odors like egg, fish and garlic inside the dishwasher. Baking soda can be used for cleaning the dishwasher itself as well as the dishes during any cycle. To increase the cleaning power of the dishwasher, you can sprinkle a handful of baking soda on the dishes to be washed, and then let it run as you normally would. The process of cleaning the dishwasher with baking soda is very similar to the one involving white vinegar – just throw in some baking soda and let the machine run for an entire cycle empty. It’s recommended to wash the dishwasher at least once a month, and as previously mentioned, at least once before using it to do the dishes after a long period of inactivity. What you need to do is simply add 50 grams of baking soda during the rinsing phase as you let the dishwasher run a full cycle empty. Soda has great degreasing properties as well as the ability to neutralising and prevent unpleasant odors. Baking soda has absorbent properties when it comes to smells, thus putting a small container with soda inside the fridge, wardrobe or shoe rack will prevent the development of any undesirable scent. You just have to remember to change it every three months. However, despite its efficacy, vinegar is a better option to get rid of the smell of eggs, fish or garlic inside the dishwasher. Unpleasant smells in the dishwasher can be a great annoyance. They originate from organic residue trapped in every corner and narrow creek of the machine. If you act fast when it comes to the smell of eggs, fish or garlic, washing it with vinegar is enough. However, when the residues are left to reside for a long time in between cracks, inside the filter and in the drain, cleaning the dishwasher becomes a bit more complicated. You would have to remove gaskets, the drain, plugs (like the one for the salt) and clean it manually to remove the dirt before rinsing it with vinegar. If this sounds like a lot of work or you have tried to do it without any results (due to the several gaskets of the dishwasher that are difficult to handle), you may need to use degreasing products and special limescale removers. When organic residues are persistent and stuck in places hard to reach by the water, you can use chemical products to remove them and clean the inner tank and filters at the same time. There are specific products on the market to clean, sanitise, disinfect, and remove limescale from inside the dishwasher. A commonly-accepted recommendation is the Electrolux detergent that’s compatible with any type of dishwasher. It suffices to use it three times a year to prevent and treat the issue of unpleasant smells, and to solve in a semi-permanent way the problems of limestone deposits and stubborn dirt that can make pots and glasses look cloudy and generate bad smells at the end of every washing. You can purchase this product at home appliances retailers, in the most supplied supermarket and online. On Amazon, you can buy it for 7,10 Euro with free shipping. For further information, check out this page.